Are you also wondering what to give your husband, daugther, nephew or cousin for Christmas? Then today is your lucky day. At Unisportstore Christmas has arrived, and we have selected the five best gift ideas for Christmas. A nice helping hand to make your Christmas easier. Christmas can be a chaotic and hectic time of the year, especially when thinking about all the presents you still have to buy. Not to mention actually finding out what to give to your loved ones. But worry no more. This year, you can finish your Christmas shopping before the race has even started. Check out our Top 5 Christmas Gifts below, but hurry up, all our choices are super popular products, so they might be gone soon. Why not be in good time for once? Do you want to buy a gift card or check out all our other cool x-mas gifts suggestions? Then explore our Christmas Site here. December 1st means that winter is officially here, and the pro's now turn to base layer to help keep them warm and dry. On our website you can find base layer items for all needs. Short and long-sleeved, as well as shorts and tights. Warm, and a little more breathable garments. We have a huge selection to choose from, and we have most of the base layer in both kids and adult sizes, meaning it's the perfect Christmas present for all ages. There are also many different colors and brands to choose from, so if you're on team adidas instead of Nike, then we've got you covered as well. Shop our Base Layer right here. With the 2018 FIFA World Cup Draw today, next summer's big event is moving ever closer and closer. You can almost feel the vibe. So why not warm up for the World Cup already? The Telstar 18 takes great inspiration from the first adidas World Cup match ball in 1970, the Telstar. However, the Telstar 18 is a modern and improved version, and it's available in various price points. The Telstar 18 Top Replique is a cheaper alternative to the official Telstar 18 World Cup match ball, but it still features some of the same technolgies, making it the perfect gift the football nerd or the person who needs a new football. Take it from us, the value for money on the 35 euro version is crazy! And if the normal sized World Cup ball isn't enough for you, you can also get the Telstar 18 Jumbo ball that's big enough to be your new rolling chair. Shop the adidas Telstar 18 World Cup ball right here. As mentioned above, it's crucial to take care of yourself when the temperature outside starts to drop and you want to play some football or even just go to practice. You can do this by wearing some player gloves, which ensure that your hands are not going to freeze and fall off. They are one of our most popular products during Christmas and well worthy of third place on our list. Here at Unisportstore we have a large selection of different Nike, adidas and Under Armour gloves for players. So you can get gloves from different clubs or even some plain gloves. The perfect budget x-mas gift for both kids and adults to keep the people you care for warm on the pitch. Shop our Player Gloves right here. Now for an all time Christmas gift classic. Does the person you're looking for a gift for support Real Madrid, Manchester United, Liverpool or Barcelona? Don't worry, Unisportstore offers one of the largest selections in the world. We offer a huge variarty of football shirts, from the biggest teams to the smallest teams out there. You can find football kits in both kids and adult sizes, and you can also choose to name and number printed on the back, if you want to. It can be a star player or the name of the person who'll receive the shirt. 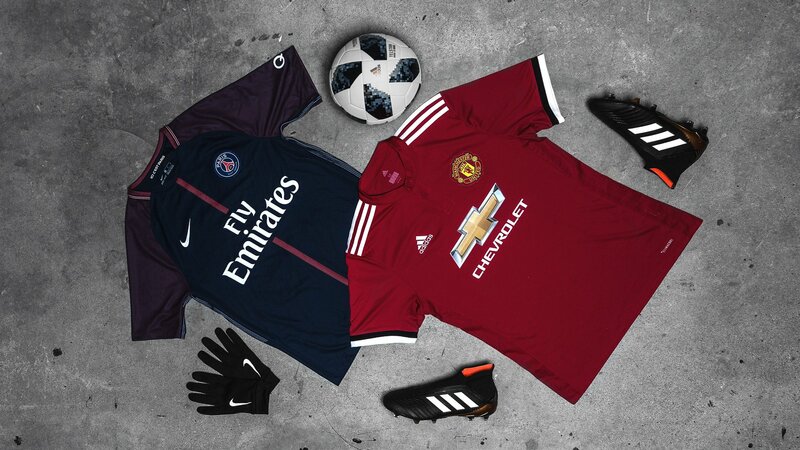 There's no doubt that a football shirt is one of the most popular football items out there, and as long as you remember to pick the right team, then it comes with a guarantee of making the recepient very happy. Shop our Football Shirts right here. One of football boots' biggest icons has been reborn. The Predator is back. The Predator 18 makes its debut in the awesome Skystalker colourway and is worn by some of the biggest stars in the world of football, including Paul Pogba, Dele Alli and Mesut Özil. The Predator 18 is an highly innovative and modern version of the original Predators worn by the likes of David Beckham and Zinedine Zidane, so both kids and adults will have a connection to this ultra popular football boot. And one of the best things is that if you get the adidas Predator 18+ FG/AG, then you can use the boot on both natural and artificial grass pitches, making it perfect fot the cold winter months to come. It's a big gift to give, but will mean the world to any footballer lucky enough to get a pair and that is why it takes the top spot on our Top 5 Christmas Gifts for footballers list. Shop the adidas Predator 18 right here. Do you want to buy a gift card or to check out all our other cool x-mas gifts suggestions? Then check out our Christmas Site here.